Why is Iran targeting its opposition? Dissidents block the goal of Tehran—to control Baghdad and Damascus where we are fighting the Islamic State of Iraq and Syria (ISIS). Washington's evolving strategy is DOA on the Hill unless the administration reaches out to the opposition and sees Iran as a threat across the porous border. Saudi Arabia's alignment against Iran includes Israel as a silent partner. Saudis view Tehran and Damascus unfavorably. A potential partner for Riyadh and Washington is the Iranian Resistance that rejects clerical rule in Tehran. All define the threat as Islamist. Saudi Foreign Minister Adel al-Jubeir asked, Is Iran a "state or a revolution?" If it wants to export its 1979 revolution and revive the Persian Empire "we cannot deal with it." Israeli Prime Minister Benjamin Netanyahu said in his UN speech on October 1 that shifting alliances in the Middle East drew Arab countries like Saudi Arabia closer to Israel in confronting Iran and ISIL. 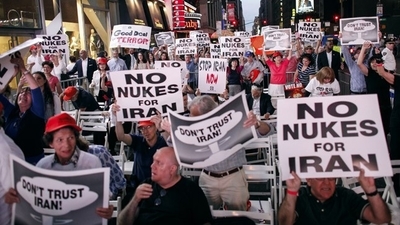 His speech before the Congress stated that, "Iran's regime poses a grave threat...to the peace." On April 29, the House Foreign Affairs Committee held a hearing, "ISIS: Defining the Enemy." Maryam Rajavi is President-Elect of the National Council of Resistance of Iran (NCRI), the coalition of which the MEK is the largest unit; she testified from Paris. Her written testimony showed how Tehran is an Islamist epicenter of terrorism to establish an Empire without borders and called for empowering the democratic tolerant Islam she represented.